IBM Blueworks Live is the single source of truth for business process models across your organization. Use a tool born on the cloud and built to efficiently model business processes with ease. 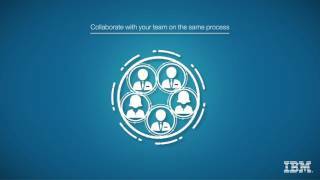 Watch this video for a one-minute overview of how to model and optimize your business processes - visually, simply and collaboratively - with IBM Blueworks Live. IBM Blueworks Live provides more than just the ability to diagram your process. Integrated seamlessly within the authoring interface are key enhancements including metadata documentation, SIPOC modeling, problems and more including playback for collaborative workshops. IBM Blueworks Live provides more than just the ability to diagram your process. Integrated seamlessly within the authoring interface are simple user and group controls, business glossary import/export, governance, versioning and integrated approval and publishing workflows. Get experience with IBM Blueworks Live, learning and completing business process modeling in minutes.